The ‪#OurCityOurStories‬ is a new video campaign by the Office of Communications/Marketing in Limerick City & County Council, celebrating Limerick City Centre’s brilliant mix of characters & stories! Graveyard Tales from Limerick.ie on Vimeo. Prince Milo Petrović-Njegoš was born in Njeguši, Montenegro on 3 October 1889 to Đuro Petrović and Stane-Cane Đurašković. 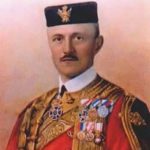 Prince Milo left Montenegro in 1919 and continued for more than a half century all around the world to struggle for Montenegrin rights and renewal of Montenegrin statehood. He married an English woman Helena Grace Smith in Santa Barbara, California, U.S., on 3 September 1927. On 23 October 1928, his only child, Milena was born in Los Angeles, United States. He left America and his family the following year and returned to Europe settling first in London. He later moved to Ireland where he owned an antiques shop. Prince Milo died in Barrington’s Hospital on 22 November 1978. He is buried in a plot he had purchased in St. Mary’s Cathedral, Limerick. You can read more about Prince Milo in an 2001 interview with his daughter Princess Milena Petrović-Njegoš Thompson here.